Spectacular Opportunity! Buy this unit separately or buy all 8 units for sale. This unit is a below market temporary church lease, option to cancel with a 30-day notice. Unit has consistently rented for $21,000+ annually. 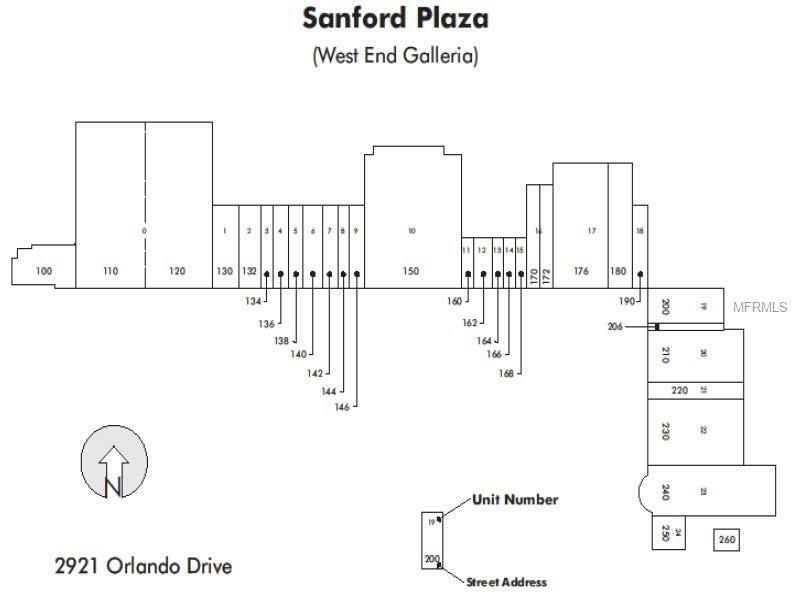 Sanford Plaza centrally located & close to everything. It is anchored by Bravo Foods, Department of Children & Family Services (DCF subcontractor-CBC) & Citi Trends. CBC generates traffic from thousands of family-oriented customers weekly as it is the largest family services in central Florida, servicing 3 counties. Pipe Dreams & the Beauty Salon have been in the plaza since it was remodeled around 1997. The Ambassador Church has been there for over 10 years. They also had a contract to purchase the building for 1 million plus. Most tenants would like a longer lease but the rents are low & will increase so we will only negotiate longer leases if a buyer has a contract subject to said longer leases. The only expenses not covered by the condo association dues which have been consistent at $1.15 per square foot for years with well over a $100,000 reserve, are the roof & HVAC. The leases typically require the tenants to cover the majority of the HVAC expenses.The entire plaza is approx 155,000 Sqft, located on 14 +/- acres. The Sanford Plaza has good traffic & great visibility to the Greenway (417). The roof is mostly foam covered with small river rock, which protects from UV rays & adds a tremendous amount of insulation with high ceilings. Unit 180, 240 & 250 have a sprinkler system.